Derrick Brown returned to Auburn to set an example for his son, his team and for players not yet Tigers. The Auburn defensive tackle had the best grade from the NFL and among draft analysts as a potential first- or second-round selection in the upcoming draft, but he instead chose to return to Auburn. Sitting in the Rane Room, surrounded by trophies of past Auburn accomplishments, he was surrounded by half a dozen rising seniors who also decided to return to Auburn. Their words were as strong as their reasoning and their bond to each other: they're returning to Auburn to win a championship. But why did the past player of the bunch return when everyone assumed he was only a tweet away from signing off as an Auburn Tiger? Let Brown explain himself, in his own words, as Auburn's anchor on defense discusses his decision process, his teammates and the future of Auburn football. I mean, I definitely thought about it a lot. The main point of coming back was to go ahead and finish my degree. I had 27 academic hours left, of my major left. It was like, come back and do it now, do it two semesters, or try to do it in the spring, and take the next three to four years to be able to accomplish that. The only opinion I really took into evaluation was my parents. They weren't telling me to stay or telling me to go. My parents told me they were happy with any decision I made. That made it so much easier on me with them telling me, and just letting me be a man and be able to handle business about it myself. DO YOU FEEL LIKE YOU COMING BACK LED TO OTHERS COMING BACK? I mean, I'm not sure. I haven't really got the chance to talk to everybody yet, because we've been busy with workouts and class and everything. We're on such a different schedule right now. But I mean, I think that I've benefited from all them coming back and I hope they did the same from me. WAS THERE A TIME YOU THOUGHT YOU'D LEAVE FOR THE NFL? I mean, having (son) Kai, that break between having Kai on Dec. 20 until the (Music City) Bowl game, I was so busy doing everything with Kai, then going to the bowl game, being busy with the bowl game, and then as soon as the bowl game was over, going back to be a dad. It was so crazy with so much going on, that I really didn't get a chance to sit down and talk about everything until that January 1st week going into everything, sitting down and talking with my parents. ... Football's gonna be football at the end of the day, I feel like everything is what it is, and I chose to be different and do something out of the ordinary. WHAT'S THE BEST PART ABOUT BEING A DAD? Oh man, seeing my son just smile. Even if he's crying or smiling, just any interaction you can get. WHAT MADE YOU THINK ABOUT THE NFL? Definitely just like, obviously that's a goal you want to do. That's a goal that you want so much growing up, that like, you finally got an opportunity in front of you. You've got to look at everything that goes on with the class you're about to come out with, and all that. ... I felt like I was a top-tier guy in that class and I'll be, hopefully, a top-tier guy in this class. I've never been afraid of competition, so like, this is just something that comes along with it. WHEN DO YOU START MAKING DECISION? My suggestion is don't think about it until after the bowl game. Because it got to a point in the year where I was thinking about it, it was putting so much pressure on me, and like, I perform so much better being calm, cool and collected. And like, in the bowl game, I told myself, if this is my last game, I might as well go ahead and give it all. If it isn't, then I'm just playing another game and I'm gonna give it my all. I finally got back healthy at the bowl. I was able to be Derrick again and I had fun with it. WHAT DOES IT MEAN TO PLAY WITH LITTLE BROTHER KAMERON? I mean, yeah, it will be exciting to have my little brother on the Plains this year. He'll be here in May after he graduates, so I'm kinda excited about that. He signs Wednesday, so I'm gonna go back home for that. WHAT DID YOU SAY TO KAM? I'm a big brother, but at the same time, it's like I live life the way I wanted to, and I chose the decision that I chose, so I'm gonna let him do the same. Because at the end of the day, I'm not gonna be there to guide him through all the process. I mean, any questions you may have concerning what he wants to do for school, I can answer things that I've experienced with my personal experiences, but when it came time for him to make decisions and where he wanted to go to school, I let that be on him. WHAT HAVE YOU NOT ACCOMPLISHED YET THAT YOU WANT TO? I think I came back with the opportunity now to play for national awards. Last year, I kind of took an injury so it kind so my mentality got messed up a little bit. But I think going forward now, having Kai, I mean it's crazy how much more motivated everything becomes, the little things in life don't mess or bother me any more because it's so much more beneficial to have him in my life because I'm getting so much more out of him being here. DID YOU GET A DRAFT GRADE? Late first to second (round). DID YOU GET ANY FURTHER FEEDBACK? You send it in and they send you a grade back. ... You can take the grade for what it is, but at the end of the day, the GMs are the ones that make the decisions. Since I've been here, (defensive line) coach (Rodney) G(arner) has talked to me about my pad level and stuff like that. Those are things I want to be better at. I want to be better. I want to take care of all the little things now, so I when I get to the next level it won't be a problem. Also, just putting myself in position to win national awards. I also know that, in doing that, I can only be beneficial in improving myself by helping all these other guys out, being one on defense and being one as a team. 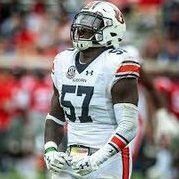 DID YOU TALK WITH DE MARLON DAVIDSON DURING THE DECISION? We were in communication a lot about it. At the end of the day, he made his decision, and I made mine. Last time we talked, really, was the bowl game. I called maybe once or twice and was like, 'I love you. Whatever decision you make, you know I love you.' He gotta do what he gotta do, and I gotta do what I gotta do. WHAT WAS COMMUNICATION LIKE BETWEEN YOU GUYS BEFORE ANNOUNCING IT? It was just like, 'Let's do it.' It was me, Marlon, DT, defensive guys, we talked to each other. We said that, if we're going to do this thing, let's do it right. DOES COACH GARNER START BEING NICE TO YOU AFTER A WHILE? Nah, coach G don't change. It's just one of those things. You know, I love coach G because, on the field and off the field, he treats us like we're his sons. That's beneficial to us. He's not just yelling at you. Everything he says, it's all for a purpose. When I first got here, I didn't understand that. Being here for a while now, you understand that. He's here for you more than you think. Coach G is going to be coach G on the field. As soon as you step foot on the grass, a switch flips. He gets the best work out of us. Having someone push you like that and treat you like a grown man, that's all you're going to get at the next level. You may not have someone who cares about you as much as coach G does. DO YOU TELL YOUNG GUYS THAT ABOUT COACH G WHEN THEY COME IN? Yeah. Coach G is going to treat you like a grown man. He may say something to you. You really need to get over it. At the end of the day, you're going to be so much of a better player if you grow up now. When you get to the league, nobody really cares. Just talking to the guys who have been up here before me — [Montravius Adams, Carl Lawson] — you get an understanding that it's business. People punch in, in the morning time and go home in the evening. They go home to their families. They're not wanting to hang out in the dorm. The whole culture changes. DO YOU TALK TO KIDS ABOUT THE IMPORTANCE OF WANTING TO COME BACK TO GET YOUR DEGREE? Oh yeah, definitely. My parents have education a high priority all my life. Whenever we get Cs, that wasn't OK in my house. It was a big problem. Going forward, I'm going to preach that to my kid. Any speech that I ever give to young kids, that's something important that I'd instill in them. DO YOU FEEL LIKE YOU'RE SETTING A NEW STANDARD WITH YOUR STUDENT-ATHLETE LEADERSHIP COUNCIL PARTICIPATION? I'm trying to be the first one to change the culture. For so long, a lot of these things didn't involve football. I want the young guys to see it's possible to do both. You don't have to be quiet. You don't have to hold back your voice. Last year I sat down and talked to Ms. Robinson. She was asking if I wanted to run for anything in the student-athlete advisory committee on the executive board. I was like, 'I don't know.' She was explaining to me how football players complain about a lot of stuff, but then they have no representation. They make the most money that's being brought in, and then they complain about things, but they never have any say because they don't have any representation. I just took that as a challenge. I want to be the difference maker. I want to be the one who steps in and makes that change. DO YOU FEEL LIKE YOUR ROLE WILL BE A LITTLE BIT DIFFERENT? I need to step up and be a leader. A lot of guys that left before me, they were leaders for the team. I did my part, but I feel like I'm the guy who does his work and doesn't say much. I give the team the best I've got, and I don't say much about anything. Now I've got to step out of that and get comfortable being a leader. WHAT ABOUT THIS DEFENSE NEXT SEASON? We faced adversity every single day going through all this. It's one of those things where we had a down year, and everyone kinda took that personally. That's not our brand of football. That's not what we want to put out on Saturdays. Everything is different this year. We've all got different mindsets on how we want this thing to go. It's just one of those things. It's not everyone talking about it. We don't have to say nothing about it. I really wish every player had his ethics! Man I love this guy.....quiet, humble, well spoken. There is nothing “me” about him. Sounds like he has a great family too. As a fan of Auburn football I love this. But if I were advising any player with the best draft grade at their position who was likely to go in the first round or second round of the NFL draft, I'd tell them to go, that they should strike while the iron is hot and secure their future. I hope this works out for him exactly as he wants it to. So here's to a dominant senior season free of any serious injury and an even higher draft grade next year. Prayers for a hedge of protection around Derrick Brown! I want him to achieve all of his dreams, academically and professionally, and pray that he will not get hurt next year. Such a class guy. WDE there needs to be more like him. DB5 is cut from a different cloth. I hope he and his brother are alike.